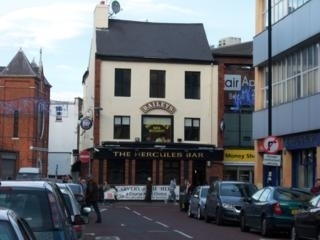 Hercules is a busy city centre bar which serves pub food and is often a place to find traditional Irish music on Saturday nights. The Hercules bar takes its name from Hercules Street, the previous name for Royal Avenue which itself was named after Sir Hercules Langford. The bar was founded in 1875 by Patrick McGlade, who, with his brother Francis, went on to establish many other licensed premises in the city. The Hercules name dates back to 1901, when it was known as the Hercules Wine and Spirit Stores. Have you got Google Earth on your computer? If so, then download the Google Earth view of Hercules. Is this the wrong position for Hercules? If you think so, then modify its position. Click / Tap the button above to get directions from where you are to Hercules. Seen the menu board with a 'Classic 80's Menu' It looked good and I must sy I had an excellent homemade pate, followed by a great Chicken Maryland...no room for dessert, but they sounded great. Overall a very pleasing experienc. I will be back for one of those Knickerbocker Glories. Recently visited 'The Herc' for something to eat in the upstairs restuarant on a Saturday, the food was tasty and good, pleasant staff and was reasonably priced. After my food i went downstairs to the public bar and it was just as good because i had good craic with the other customers and the bar man was nice. I reccommend you go there, especially on a Sunday for the cavery stlye meal. Ended up in the Herc with a group of guys on a Friday night and had a great time. The bar staff were friendly and, on the Saturday night, there was a session. Dropped into this bar today and had what is proably the best burger I have ever had. The service was great, the presentation was superb and the price was just right. I think the restaurant was called Oomami. Well done and a great menu all round. if your looking to b ignored and cold food this is the bar to go in to, the bar staff hav no respect for thier customers and certainly no how to make you feel unwelcome!! I Went for a quiet lunch and it was good.... if you consider ordering food and not getting it good, i would recommend going to the hercules if you have hours to waste and like ordering your food 3 times! !